Chocolate rosé watermelon pops. Yes, you read that right. Today’s recipe is easy to make, delicious, and will make you the star of your neighborhood BBQ when you show up with these bad boys in hand. They’re a “healthy” alternative to traditional summer ice cream, with an adults only twist. And they’re SIMPLE to make. Plus, rosé. Do I really need to say anything else? 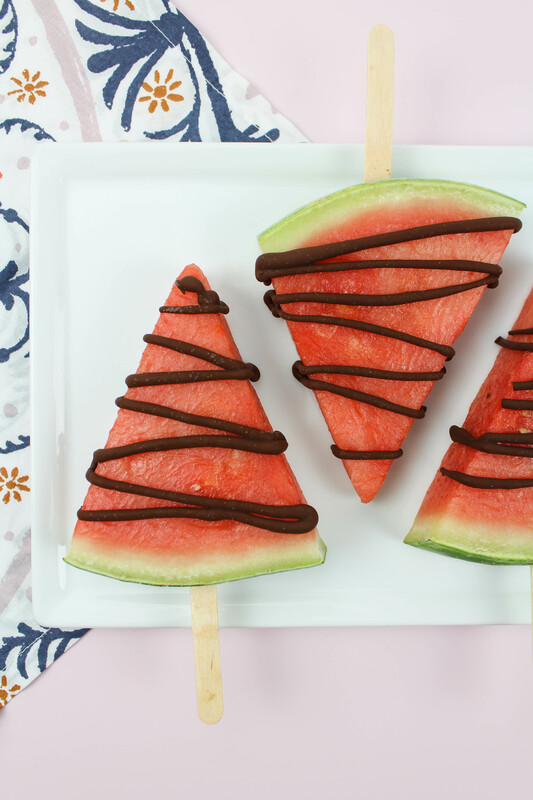 Now you might be thinking, chocolate + watermelon?…how is that supposed to work? But, trust me. With a little help from the freezer, these two are a match made in heaven, with rosé playing a huge role in this hook up. 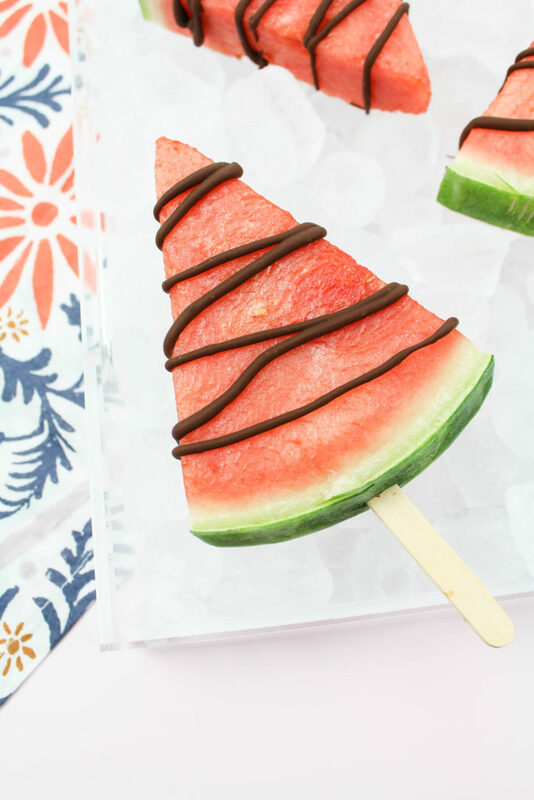 I have a feeling these chocolate rose watermelon pops are about to become your new summer go-to. 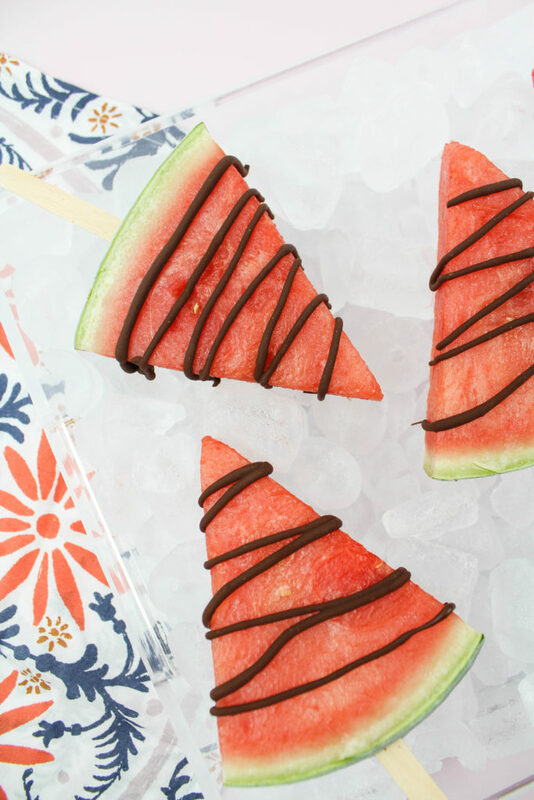 First, insert your popsicle sticks into the bottom rind of each watermelon wedge. 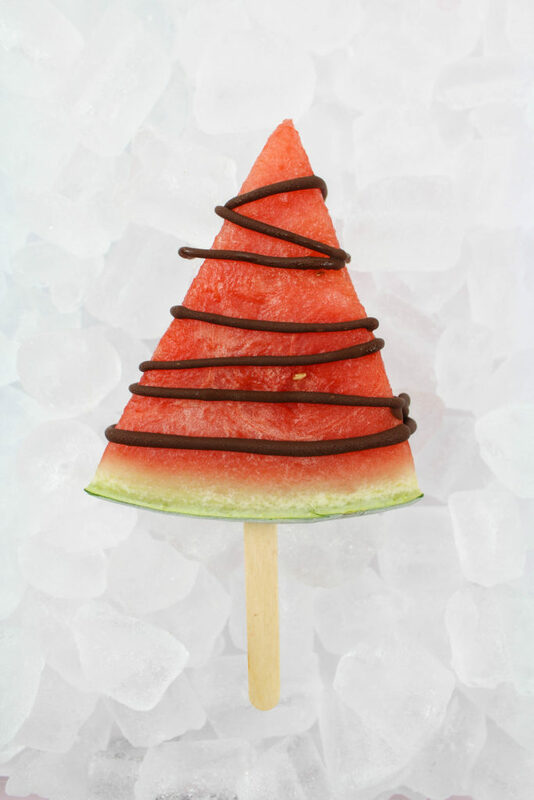 To make it easier, you can cut a small slit into the rind before pressing each popsicle stick into the wedge. (Be careful not to punch through the watermelon when you’re inserting them). In a shallow dish or bowl, pour the bottle of Rosé. Place each watermelon wedge into the rose’ and allow them to soak for 10-15 minutes. While the wedges are soaking, place parchment paper on a baking sheet. Remove the watermelon wedges from the rose’ and place them on the baking sheet. Place the baking sheet in the freezer and allow the watermelon wedges to freeze completely. Once the wedges are frozen, begin melting the dark chocolate chips. The amount of dark chocolate chips needed, will depend on how many wedges you’ll be making. I aways start with about 1/3 of a bag of chocolate chips and add more as needed. You can melt the chocolate chips using the double boiler method, or melt them in the microwave in 30 second increments, stirring in between each heating cycle. Once the dark chocolate chips are melted, remove the baking sheet of watermelon wedges from the freezer. Place the melted chips into a piping bag. (This will help to make the drizzle a lot easier to control). To keep it mess free, I use a tall drinking glass to hold my piping bag, while adding the melted chocolate. Once your chocolate is in the piping bag, begin to slowly drizzle the chocolate over each of the wedges. 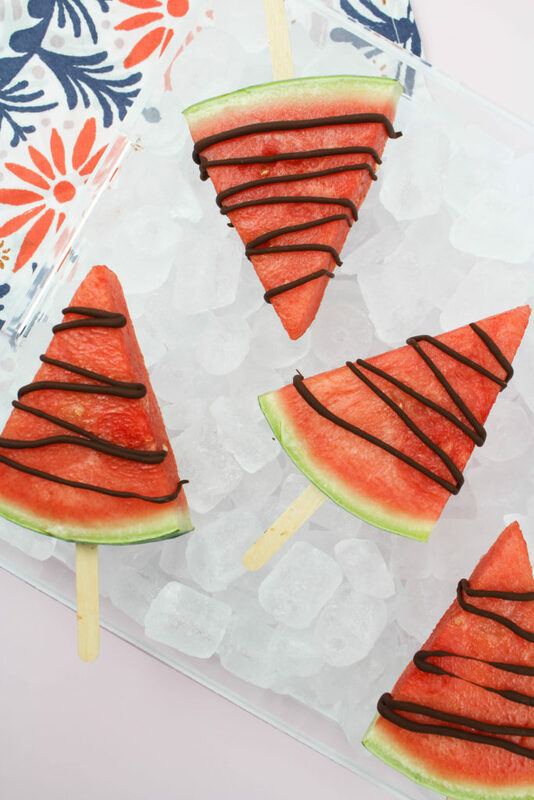 When all of the wedges have a chocolate drizzle, place the baking sheet of watermelon wedges back into the freezer and allow them to freeze for a second time. 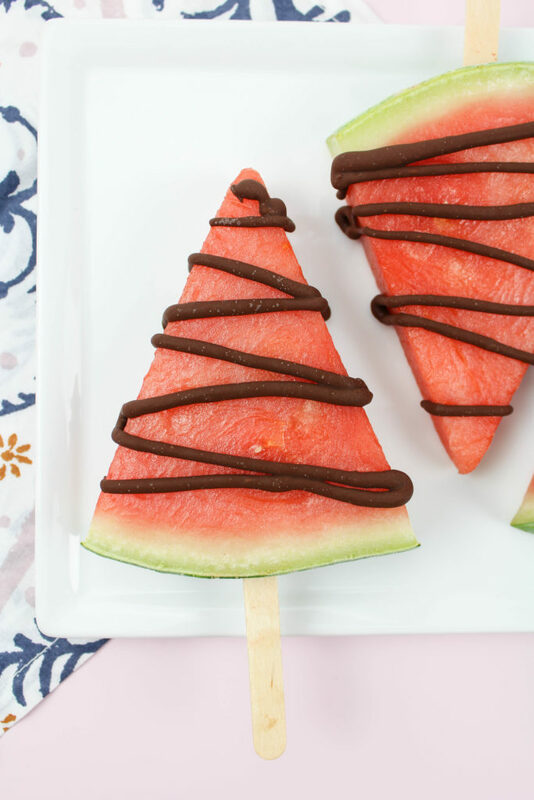 Remove the chocolate rosé watermelon pops from the freezer when you are ready to serve and eat them! 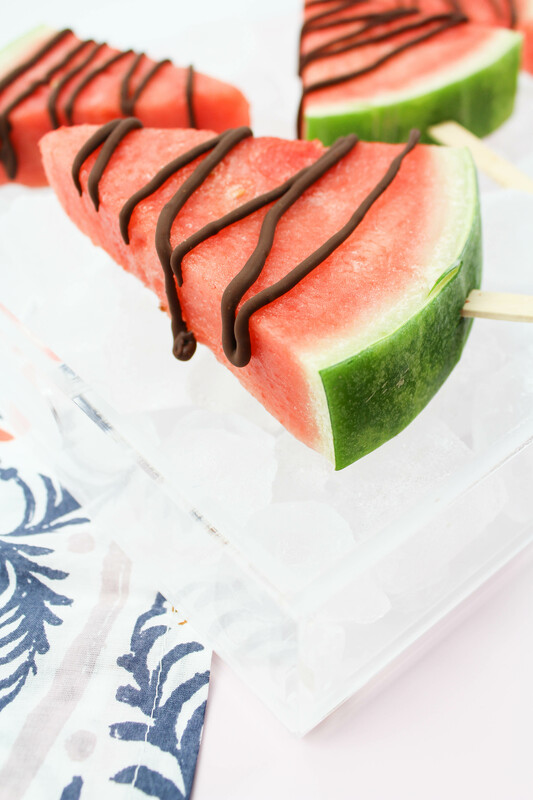 They are definitely a healthier summer treat and oh, so delish! Plus, who can turn down rosé! I know I can’t! ?